Mr. Stokesberry was born in 1917 in La Junta, Colorado. His father was a farmer most of his life, and they moved often. Mr. Stokesberry was the oldest of six children, three of whom were boys. Both of Mr. Stokesberry’s brothers served in the U.S. Army during World War II. One of them, Anthony, was killed on Leyte Island, Philippines, in 1944. 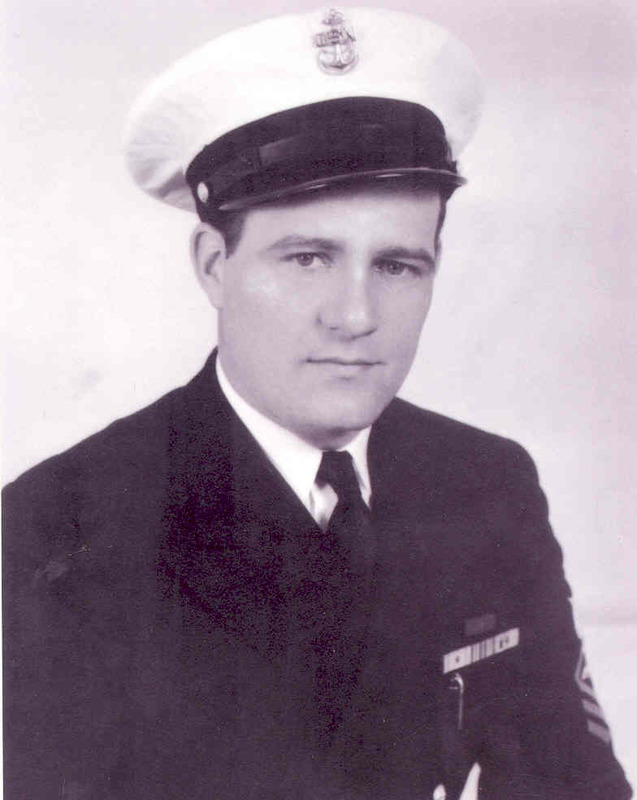 Before and during the war Mr. Stokesberry served on USS Yorktown, at Kaneohe Naval Air Station, Hawaii, and Johnston Island. However, most of his war years were spent aboard USS Independence, CVL-22. He stayed in the navy after the war, served in the Korean War, and retired from the navy in 1959. He now lives on four acres in Orangevale, California. The USS Independence started off as a cruiser, CL-59, but was converted to a light aircraft carrier and commissioned as such in 1942. After the war, she served as an atomic bomb target ship at Bikini Atoll, and was later sunk off the coast of California in 1951. I graduated from high school in 1936, but me and one of my younger brothers continued to help my father on the farm and work for other people until 1940, when I put in to join the navy. I liked farming and worked hard at it, but everything I made my father took. I worked for four years after I graduated from high school and didn’t make a dime. So in January 1940, I was accepted into the navy and went to boot camp in San Diego. After boot camp, I put in a request for the USS Enterprise. The Enterprise was up in Bremerton, Washington, but her sister ship, the USS Yorktown, was in California, and I was put aboard her. On 1 April 1940, we pulled out for maneuvers, then headed for Pearl Harbor. I stayed on the Yorktown for about a year, then in February 1941, I got orders to go to Kaneohe Bay. Kaneohe Naval Air Station was commissioned the day before I arrived. By then I was a third class aviation metal smith. I stayed there at Kaneohe and made second class by the time the war started. I was what they called “ship’s company.” I wasn’t in a squadron. When I had the duty, and I had the duty on the morning of 7 December 1941, I was to go to the Public Works building and get the garbage truck, and go around the base and pick up garbage. I was on my way down there to pick up the truck when I saw my first Jap plane. He had just banked over and I saw that meatball on his wings, and he started strafing our airplanes that were parked at Kaneohe. I was close to the administration building, so I went in there and told the Officer of the Day that we were under attack and he thought I was crazy. At about that time somebody from one of the squadrons called and told him that the Japs were strafing our sea planes moored in the bay and they were on fire. Then he believed me. I went back outside, but I didn’t dare try to get to the garbage truck. It was getting pretty hot, so I hid under the steps going into the administration building. I saw this one Jap plane come in over a hill with his guns blinking. He came down and never pulled out. He crashed a couple of hundred yards from me. That afternoon, after everything got quiet, me and another guy went up to the crash site with a bomb truck. I took the instrument panel out of the plane and I still have it. I stayed at Kaneohe until October 1942, when I received orders to go to Johnston Island. Johnston Island was only about sixty acres and had a lot of gooney birds, boatswain birds, and moaning birds. The moaning birds would get under our barracks at night, and they sounded like babies crying. When I got to Johnston Island, the navy was dredging a channel in the lagoon for the patrol planes that operated out of there. There was one old J2F, an amphibious plane made by Grumman. It was a single-engine biplane, and was used to fly morning and evening antisubmarine patrols. We later got two PBYs in, and they were also used to fly patrols, sometimes being out all day long. There wasn’t much aircraft maintenance for me to do, so I spent a lot of time filling sandbags and all sorts of other odd jobs. And we had drills day and night because we never knew if the Japs were going to try and take the place. There were a bunch of marines down there, too. I think they had 155-mm guns, and they had dogs all over the place as sort of an early warning system in case the Japs tried to sneak ashore. But people sent down to Johnston were usually there for only six months. The senior medical officer said he wouldn’t be responsible for a man’s sanity after six months. There was nothing down there but work and gooney birds. When my six months were up I was sent back to Pearl Harbor to Overhaul and Repair on Ford Island. It was mostly steel and aluminum fabrication. For example, when the navy started training pilots to be night fighters they wanted a flame dampener so their exhaust flame couldn’t be seen at night. We made those at our shop. While I was there, I made first-class, then chief, and became the shop foreman. That was in September 1943. Then one day I saw a guy at the shop and he was pointing at me. He came up to me and said, “You been out here a long time, haven’t you?” I said, “Yes, almost four years.” He asked me if I would like to go aboard ship. I said, “Which one?” And he said, “The Independence.” He told me that while the Independence was off Tarawa she got torpedoed, and while he was walking down the flight deck somebody sitting in the cockpit of one of the fighters on deck squeezed the trigger on the plane’s guns. One of the bullets hit him right above the right eye. Everybody thought he was dead, but it only knocked him out. He said, “I’ll be honest with you. I want to get off that ship.” So I traded with him. I went aboard the Independence, and he took my job on Ford Island. I went aboard on Christmas Day, 1943. The next day we headed for California–Hunter’s Point--and arrived the day before New Year’s. The USS Intrepid was in dry dock, and we had to wait for her to get out before we could go in. She pulled out the next day and we went into dry dock. The yard workers had to cut a hole in the flight deck and bring up all of the damaged equipment up through the hole. We had fourteen compartments flooded and three screws gone from the torpedo hit she took off Tarawa. After four years, I was glad to get back to the States, and we were in dry dock for about six months. We were still in dry dock when the Intrepid got hit again, and came back to Hunter’s Point. When we finally got underway again we went to Pearl Harbor, and as soon as we arrived we received orders to develop and train for night operations–TBMs and fighters. The TBMs and fighters had a radar dome on the starboard wing. We would go out at night and the planes would take off from Ford Island and come out and land on the Independence. We were doing a lot of experimenting, and we had to find a way of lighting the flight deck enough for the pilots to land at night. What we did was make little boxes, open on one side, and put them at each end of each arresting wire on the flight deck, and the electricians put little light bulbs in them. That way the light could only be seen by the pilots from the stern of the ship as they came in to land. The stair-stepping of the lights also gave the pilots some idea as to how high they were as they came in. The Landing Signal Officer had strips of luminous cloth down the front of his torso and on his signal paddles. Then a light was shined on him so that it reflected off the luminous strips on him and his signal paddles as he directed the pilots on their final approach. While we were conducting these experiments in night flying we just about wiped out one entire squadron; they had so many accidents. Then we took aboard another squadron–CVLGN-41. They did pretty good at night flying, so we went out with them aboard to join the rest of the fleet. The Marianas operation had just been completed, so we stopped at Saipan. We then headed for Peleliu, and then the Philippines. The Japs started sending out these four-engine flying boats at night–Emilys. Specializing in night operations, we would go out about fifty miles from the rest of the fleet along with two destroyers as escorts. Our ship’s radar would pick up these Emilys coming in and vector our night fighters to intercept them. The Emilys didn’t have any flame dampeners on their engines so they lit up like Christmas trees, and our night fighters would just slide in behind them and shoot them down. One of the pilots told me he put less than fifty rounds into one and it just blew up. Our day planes would bomb the air strips in the Philippines, and the Japs would go out at night to make repairs. We called our night TBMs “Hecklers.” They would glide down over their runways at night, drop their bombs, then pull back up. They did that all night long so the Japs couldn’t repair their runways. During the Battle of Leyte Gulf, a Betty came up on our starboard side. It was right close to the water and flew over the top of an antiaircraft cruiser and they didn’t even see him. The Betty went for the Intrepid, and she got hit again. I think we were only a quarter of a mile from her when it happened. I could see what happened real plain. One of my best friends on the Independence was a photographer’s mate, and he gave me some pictures he took of the kamikaze hitting the Intrepid. When the Betty hit the Intrepid it wiped out most of the gun crews on the starboard side, aft. The next day, I watched as several bodies of those killed were dumped overboard. I think it was in 1992, or somewhere around there, I read in the newspaper about this colored gun crew on the Intrepid, and how they stayed with their 20-mm gun and kept shooting at this Betty while the other gun crews abandoned their posts. The article said that nine men in that gun crew were killed and six others were wounded. All the survivors were told they would get the Navy Cross for their bravery, but because they were colored they got the lesser Bronze Star instead. One of the men from that gun crew, Alonzo Swann, fought for forty-eight years to get that Bronze Star award upgraded to the Navy Cross for himself and the rest of the men in his crew. When I found out about that, I had copies of the photos made. Then I wrote a letter about what I saw that day and sent it along with the photographs to the hometown newspaper where that colored guy came from. I don’t know if that helped him get his Navy Cross or not, but I like to think it did. On the Independence I was the “structural chief.” I had to make the decision whether or not a damaged plane was salvageable. If it wasn’t, we stripped it of usable parts and dumped the rest over the stern of the ship. If we had a plane that came back all shot up, or if it crashed on landing, the air officer called me up and asked what to do with it. If I said scrap it, the radio men would take all the radio gear out of it. We would take off the wing tips, because planes were always banging up their wing tips. They were hard to repair. Then we would roll what was left back to the fantail and push it off. We lost more airplanes than pilots. They would crash, and we could usually save the pilots but not the planes. But we did lose some pilots. We lost our best night fighter pilot. He was an ace, but he couldn’t find the ship one night. He asked us to turn on some lights but the captain wouldn’t do it, and that was the last we heard of him. One time, I was called up on the flight deck after a crash. A plane had landed, then moved forward, ahead of the barrier so the next plane could land. The next plane missed all of the arresting wires, crashed through the barrier and hit the plane that had landed just before him. His propeller slashed through the cockpit of the plane that had landed before him and slashed the throat of the pilot. I climbed up on the wing and looked in the cockpit, and the pilot’s blood looked like a puddle of Jello. A pharmacist’s mate pulled the body out and we dumped the plane over the side. We didn’t have weekends or holidays. We were constantly on the go. I slept on the wings of planes more than once; I couldn’t get down to my bunk. Every two or three months we might pull into Ulithi Atoll for a few days. Not always, but sometimes the ship would send recreation parties ashore to Magmag for a day of rest and recreation. We would get two bottles of warm beer and some time to swim or do other forms of recreation. The next day, the other half of the ship would get to do the same, then we went back out to sea. Sometimes, it would be seventy, eighty, ninety days before we would get to go ashore again. Days would just run together. Weekdays and weekends were all the same. After the Philippines, we went up to Okinawa. That was part of the Japanese homeland, and they really put up a fight. The kamikazes really came out then. They didn’t hit theIndependence, but I saw a lot of them try to hit us. I was up on the flight deck one morning and I saw a kamikaze, and it looked like he was going to dive into us, but we started shooting at him. There was a destroyer just ahead of us and it looked like he was going to try and hit it instead, but hit right behind it. Another time, I was up on the flight deck talking to this old Marine Corps master sergeant who was in charge of a gun crew on the starboard side, forward of the island. We were walking down the flight deck, and he was always rubbernecking–always looking up in the sky for something to happen. All of a sudden he hollered, “Open fire!” At first, I didn’t see anything, then I saw the sun glint off the canopy of a kamikaze. We were the only ship firing at it, and it was aiming right down our throat. I guess our fire diverted it away from us and into the Cabot, another CVL. About two months before the war ended I received orders to go to Norman, Oklahoma, to learn rubberized equipment repair–self-sealing fuel cells. The school lasted five weeks; then I had ten days to report in at San Diego. The day I got into San Diego they dropped the atomic bomb on Hiroshima. I was then sent to a receiving station and the navy was discharging guys right and left, but I was regular navy and couldn’t get out until my enlistment was up. Millions of men were getting out of the service when the war ended, and there weren’t many jobs, so I reenlisted for two years. I was guaranteed shore duty because of all the time I had spent at sea during the war. I could have gotten killed lots of times during the war, but a miss is as good as a mile. My ship could have gotten hit, but it didn’t. At Okinawa those kamikazes were dropping all around us. We could have been hit by one of them, but never did. One of my brothers, Anthony, went into the rmy and was killed on Leyte on 11 November 1944. My other brother went into the army right at the end of the war, but survived.